A good running shoe is one that stands the test of time in a hugely competitive market place. That shoe is the ROCLITE. First launched in 2006, the ROCLITE has come in many guises over the last 10 years and proven a huge success worldwide with runners seeking a versatile shoe that can handle all types of off-road terrain. From the original ROCLITE 315 to the super-lightweight ROCLITE 243 and the more recent ROCLITE 295, runners wearing these shoes have broken global records and won world championships. It was even the shoe of choice for Kevin Carr, who between 2013 and 2015 undertook the ultimate all terrain running challenge, becoming the fastest man to run around the world. Now, to mark a decade at the top, the ROCLITE has undergone its most significant revamp to date. While the DNA at the heart of its success has been retained, five new shoes make up a fresh, exciting ROCLITE range that boasts next generation running shoe technologies. Designed for running adventures when the terrain is at its most variable and unpredictable, the ROCLITE 290, 305, 305 GTX, 325 and 325 GTX will handle anything from muddy paths to rocky trails – and everything in between. The ROCLITE 290 is our lightest (290g), most flexible ROCLITE shoe, designed for agile, fast running over multiple and varied terrains. It delivers a responsive ride and high levels of durability, making it perfect for racing both on the trails and off them. The ROCLITE 305 is a slightly heavier (305g) shoe but boasts extra comfort and protection. Super-durable upper materials provide a premium fit and feel in a shoe that is ideal for training runs over every kind of ground imaginable. The ROCLITE 325 is a lightweight (325g) boot version of the 305 that provides more support for ankles. It’s perfect for fast-paced backpacking (fast-packing) and long, arduous training runs over multiple types of unstable terrain. The ROCLITE 305 GTX and ROCLITE 325 GTX are waterproof versions of the ROCLITE 305 and ROCLITE 325 respectively. They both feature the latest in GORE-TEX product technology to ensure feet remain dry and comfortable while running. ALL-TERRAIN TRACTION: All five shoes have the same next generation ROCLITE outsole. We’ve used three different densities of sticky rubber on different sections of the outsole to ensure the best grip possible, no matter which part of the foot strikes the ground. The studs are multi directional, preventing any debris from clogging up in between them and thus further improving grip. MORE UNDERFOOT STABILITY: Each 6mm deep stud on the outsole has a wide surface area ensuring a stable feel with every footstep. INCREASED PROTECTION: Second generation META-SHANK is a rock plate that protects the underfoot from sharp rocks, while a strengthened rubber toe-cap shields the toes from obstructive debris. A CUSHIONED & COMFORTABLE RIDE: The POWERFLOW midsole delivers 10% better shock absorption and 15% better energy return than standard midsoles. THE PERFECT FIT: Built around the natural anatomy of the foot, the new ADAPTERWEB met-cradle adapts to the natural movement and swelling of the foot in motion. On the ROCLITE 290 the Y-LOCK system holds the heel in place and offers support. On the ROCLITE 305 and ROCLITE 325 (including GTX versions) the X-LOCK system offers even more heel support. 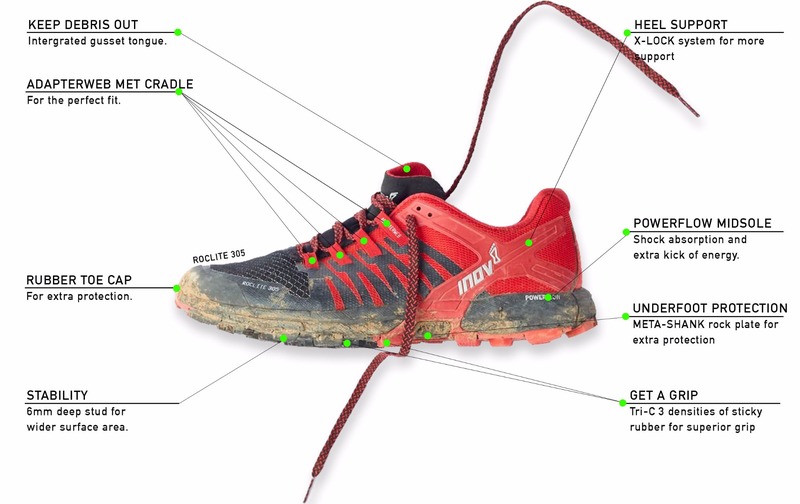 DEBRIS-FREE: On the ROCLITE 305 and ROCLITE 325 (including GTX versions) an integrated gusseted tongue ensures all stones, gravel and debris cannot enter the shoe. Our all terrain running clothing range can be perfectly paired with the new ROCLITE shoes. For the lighter, faster ROCLITE 290, we’d recommend our lightest clothing for faster racing, including the Short Sleeve Base Layer, 6" Trail Short(men) and 2.5" Racer Short (women) and our Ultra Shell Jacket. For the ROCLITE 305 (including the GTX version), we’d pair it with the more protective Short Sleeve Merino Base Layer, 8” Twin Short (men), 6" Trail Short (women) and our Thermoshell Jacket. For the ROCLITE 325 (including the GTX version), we’d recommend with our most protective garments, including the Long Sleeve Merino Mid Layer, Full Length Tights and our Raceshell Jacket.